Ready San Francisco? Inspiration will be flowing through your thoughts and your taste buds at the TFC Speaker Salon this Saturday, August 9th. Celina Agaton | Google USAID ICCM Fellow On sharing her tech-driven approach to rebuilding communities post- Typhoon Yolanda. Lourdes Tiglao | US Air Force Veteran On showcasing Team Rubicon’s approach to unlocking the potential in a new generation of veterans. Jo Ann Kyle | ABS-CBN Foundation Managing Director On the story of the Foundation’s forward-thinking approach to building better communities and inspiring a nation. And of course, Chef Tim Luym of Attic Restaurant and Frozen Kuhsterd is taking culinary control of the reception to bring out the sweeter side of Pilipino cuisine. Seats are going fast, so learn more and RSVP today! For better or worse, American colonial rule has left several legacies in the Philippines, from governmental structure to popular culture. The Pilipino public education system is no exception. When the United States took control over the Philippines in 1898, one of their first tasks was to implement an Americanized public school system that would educate the Pilipino people and enlighten them about the American way. By 1901, the United States sent over 600 teachers dubbed as “Thomasites.” On the one hand, the shift towards an Americanized public system led to drastically improved literacy rates throughout the Philippines, free primary education for all, and the founding of the University of the Philippines, the nation’s first public university. On the other hand, controlling the entire country’s education system was another means of maintaining imperial authority over Pilipinos, using the classroom to quell nationalistic ideas and impose Western values. As English became the official language of the Philippines, it also became the primary language of instruction for students over their native tongue. According to psychologist Kevin Nadal, the legacy of the Thomasites continues even today as “most Philippine educational systems have adopted American curricula, although it may not necessarily be culturally appropriate.” The extent of indoctrination that the United States has imposed over the years has stricken many Pilipinos with a colonial mentality through which they learn to value Western ideals over native ones. In many ways, the purpose for establishing a public education system in the Philippines is similar to the origin of public schools in the United States. The father of American public schools, Horace Mann, believed that “public schools should be means of social control through the teaching of Christian based morals.” This factory-model that the American public school system was founded upon is now being highly contested by education reformers in the United States who argue that the standardization of student learning stifles the creativity and critical thinking skills that are necessary to be competitive in today’s global economy. In 2002, the Makabayan curriculum was introduced to improve critical and creative thinking development and promote Pilipino values. Makabayan is described as “a learning area that serves as a practice environment for holistic learning to develop a healthy personal and national self-identity” and includes subjects such as social studies, music, health education, and values education. So what might this mean for the upcoming generations of young educated Pilipinos? We can hope that these reform efforts will develop proud citizens who value the strengths of their culture and confidently skilled students who will help propel the Philippines into a world player. Of course, when it comes to the complex issue of education there are still loads of problems waiting for solutions, from resources to poverty and accessibility. Perhaps this is at least one step in the right direction. 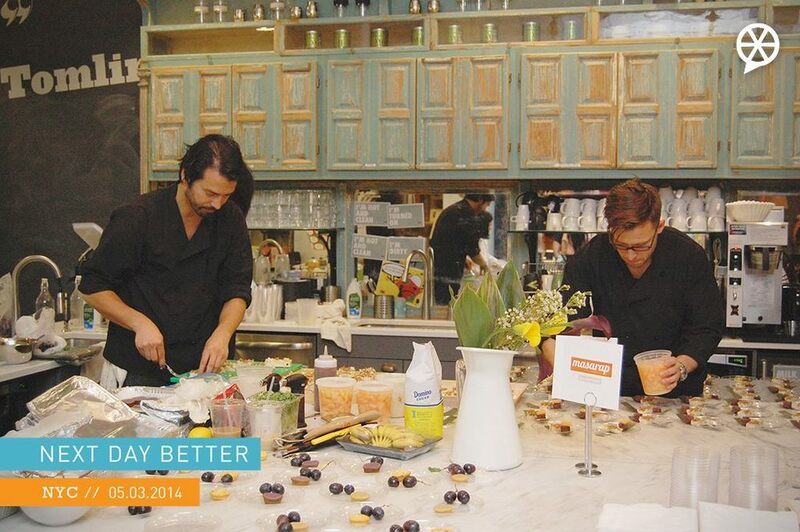 NextDayBetter's NYC Event: Great Food. Great People. Great Ideas. The event kicked off with a tableside chat with featured chefs from Bibingka-esk and Masarap Supper Club. The chefs shared not only their culinary concoctions but also their stories of how they began pursuing their love of making Pilipino food professionally and intend to play a role in its evolution. “I want Bibingka to be the next chocolate chip,” declared Binbingka-esk creator Eileen Formanes. “What can we do to collaborate and exchange ideas to make the next day better?” He explained that the presenting speakers were asked to share their stories because they were all individuals who took risks and made breakthroughs for themselves and their communities. Geena Rocero, transgender model and founder of Gender Proud, discussed the need for political recognition of transgender identity and the right to choose one’s own gender marker on identification documents. When one’s gender marker doesn’t match how a person feels on the inside or looks on the outside, it turns regular activities like applying for a job, voting, or even opening a bank account into highly stressful and embarrassing situations. “Imagine constantly divulging the most personal thing about yourself,” she proposed. Teach for the Philippines Fellow Leah Villanueva spoke about how the dream of making a better Philippines is an attainable one, but it can’t be achieved without improving public education. Currently schools in the Philippines suffer from high dropout rates, overworked teachers, and frequent electricity outages among many other challenges. “These kids deserve so much more, our country deserves so much more,” Leah noted. Restaurateur Nicole Ponseca chatted about how Maharlika and Jeepney were the first Pilipino fusion restaurants to truly own Pilipino food without apology, duck fetuses and all. Rather than hiding the less mainstream aspects of Pilipino cuisine, Maharlika held a contest challenging participants to eat as much balut as possible in five minutes. “If you’re embarrassed about anything, whatever it is, you got to turn it around and make it a sense of pride,” Nicole encouraged. Matt Grasser and Team LDLN held a tech demo in which they showed how the device and mobile app they designed could be used to create makeshift Wi-Fi networks in the event of an emergency, such as Typhoon Haiyan. Through these low-cost devices, people on the ground would be able to communicate with relief services even if power sources are down. Airforce veteran Lourdes Tiglao shared her experiences as a member of Team Rubicon, a disaster response organization comprised of American military veterans who want to continue utilizing their skills after returning home. Team Rubicon was deployed in Tacloban after Typhoon Haiyan hit and acted as first medical response for many victims. Tiglao met several Pilipino veterans who were enthusiastic about the idea of creating a Team Rubicon in the Philippines. If you were to count the amount of times I spoke up in my law class, the number would be significantly smaller than the amount of times I had raised my hand that day our class discussed affirmative action. I go to a school where there is a very small group of minorities. As a result, these minorities tend to stick together, so there is not much exposure to other cultures other than the one you belong to. When any topic relating to race is brought up in a room of those who are not of color, I’ve noticed the hesitation in people’s voices, the fear of stepping too far. In class that day, it was obvious that people did not agree with affirmative action, but to speak against it would mean risking being perceived as racist. So they ran in circles, trying to identify alternatives to affirmative action. The idea that affirmative action gives an unfair advantage to minorities has been crushed time and time again in the United States Supreme Court, so this hushed talk about affirmative action really reveals the underlying issue that people have with the program—not admitting that minorities are still at a disadvantage in education and in the workplace. When my classmates spoke of affirmative action, they tiptoed around the issue. They came to the conclusion that in order to diversify both classrooms and the workplace, the government needed to tackle the issue of poverty. It was a legitimate point, I'll give them that. But the way they spoke about poverty was as if they were trying to not overstep any boundaries. They talked about minorities and poverty as if they were two different issues. However, it should be noted that they are intertwined. That’s the problem—not stepping far enough and not admitting that there is a disproportion of minorities in our education system and the workplace. You literally did not even have to leave that classroom to see the lack of balance. There were four other minorities in the class of twenty students, only one of which actually spoke up with me. The blatant oversimplification of affirmative action and diversity was incredibly frightening to see, especially on a college campus. There is a unique bond between two people who belong to the same ethnicity or gender, one that cannot be found anywhere else. However, when a college’s minority population is so small, the need for a community with a common background is even further exacerbated. This is why minorities form and stay within their cliques. This is why minorities may have limited exposure to other cultures, ideas and viewpoints. And this is why a packed room with only a handful of minorities had trouble understanding exactly why we need affirmative action. How can you make the next day better? On May 3rd, NextDayBetter is kicking off their global speaker series for 2014 in New York City. The series is themed “Defining Breakthroughs: Unlocking Human and Community Potential” and will feature inspiring speakers who will share how to make real, visible change for communities in the Philippines and beyond. “The global Filipino Diaspora is a hub and inspiration for world-changing ideas that pushes humanity forward,” says CEO and Co-Founder Ryan Letada. “This global speaker and action series is designed to celebrate and amplify the impact of these ideas." This event is not only going to satiate your hunger for change, but will feature great food and drinks as well. Living up to its claim for creative innovation, NextDayBetter will even showcase a Tech Demo in which hackers will present smart technologies focused on disaster response and resiliency rebuilding. Seats are limited so register now here. If you can’t make it to NYC and/or are thirsting for more inspiration, don’t you fret because NextDayBetter will also be hitting up Los Angeles, Toronto, San Francisco, and London during the upcoming months. To learn more about NextDayBetter and the speaker series, you can visit their website.